Apple Inc iPhone 5C 'experience' now for everyone flaunting company's smartphone. On 11th September 2013,Apple Inc. officially unveiled the long-rumored iPhone 5C globally,which was made available in India’s grey market on 24th September and,considering that the cell phone is ‘flying off the shelves’,to protect the pricey product,your friendly neighbourhood ‘enabler’ is now offering some top end covers too. So,for all you who felt something was still missing,even as you flaunted your flashy iPhone 5C,here is (more) satisfaction. The grey market for the ‘variety is spicy’ theory believers,has ‘arranged’ customised covers and cases for iPhone 5C in both Mumbai and Delhi. To make sure that you are not unnecessarily put out of pocket,the cases are on offer at a very nominal price tag. And,no matter which smartphone model you pack,the covers will fit one and all. So,say cheers! You just bought into the iPhone 5C experience. Elaborating on the covers,he added: “Spiderman,Barbie doll,Tweety,Batman themed cases and covers start with the price range of Rs 250. 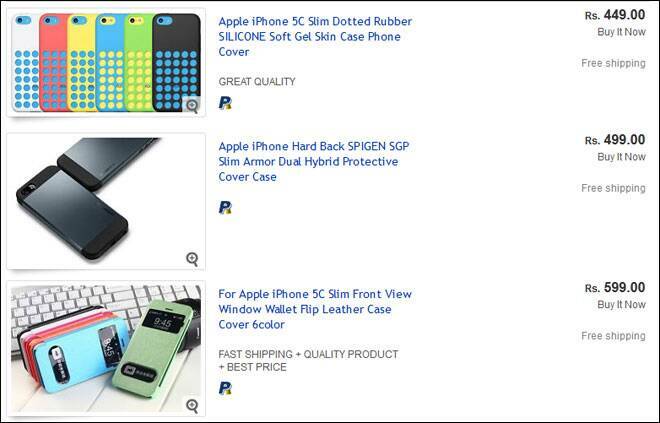 Online shopping websites like eBay too have various attractive offers for the iPhone,though at a marked up price  basic dotted rubber silicon soft gel skin for iPhone 5C is available at Rs 449 and front ‘window’ leather cover at Rs 599. There is an added bonus too. Free shipping also included. So,’ifreaks’ grab your cover and start showing off!!! 3 Google search making people more forgetful?